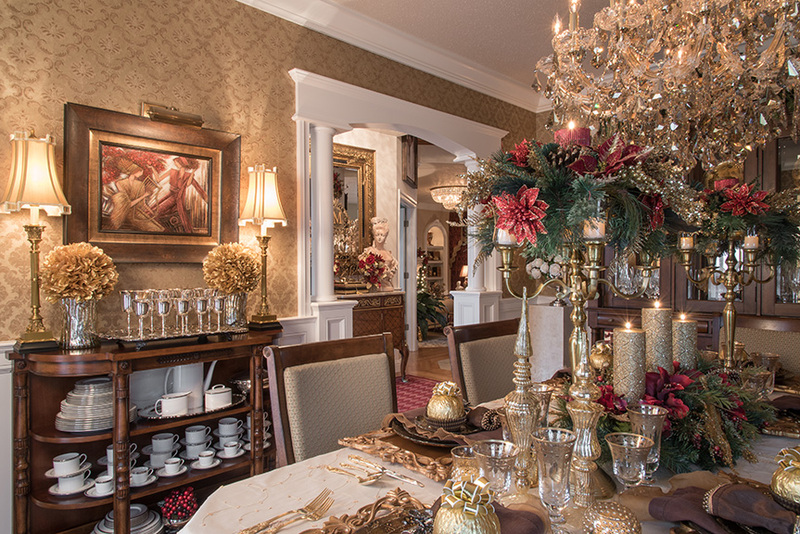 Tradition reigns supreme in this European-styled Illinois residence. Balance and symmetry are important to the homeowner's traditional design aesthetic. Almost every item you find is a matching pair. Olga loves a formally set dining table, and her Arte Italica glassware and dinnerware are among her favorite pieces on the table. 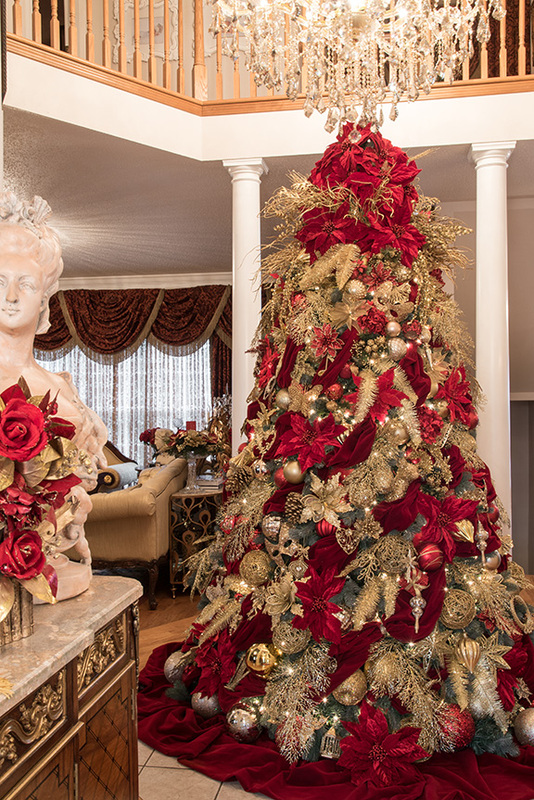 Tones of gold and rich burgundy carry from the homeowner's normal decor into her holiday ornamentation. Special touches, like a gold artichoke ornnament on each place setting, make each guests' spot at the table over the top. 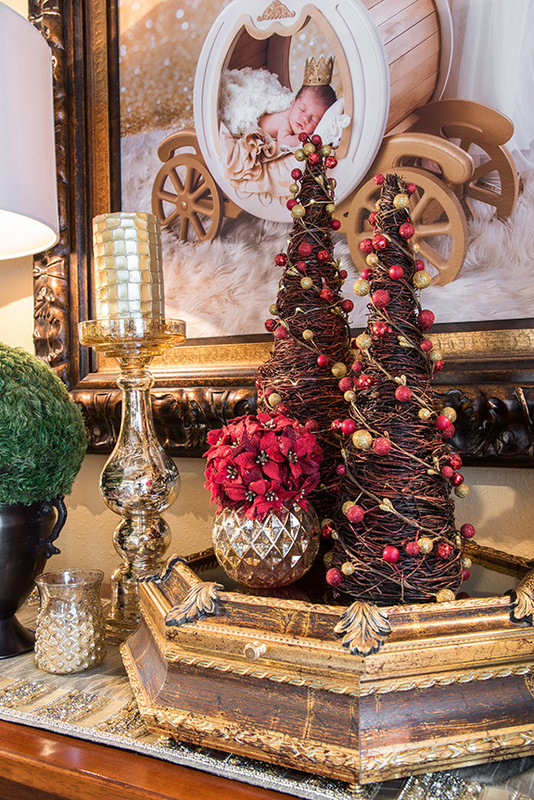 Draped in velvet fabrics, the tree is tucked with handpicked treasures found by the homeowner. An iron double console table with hand-forged iron scrolls is topped with granite and festive adornments. The sitting room furniture was purchased from a luxury Italian collection. 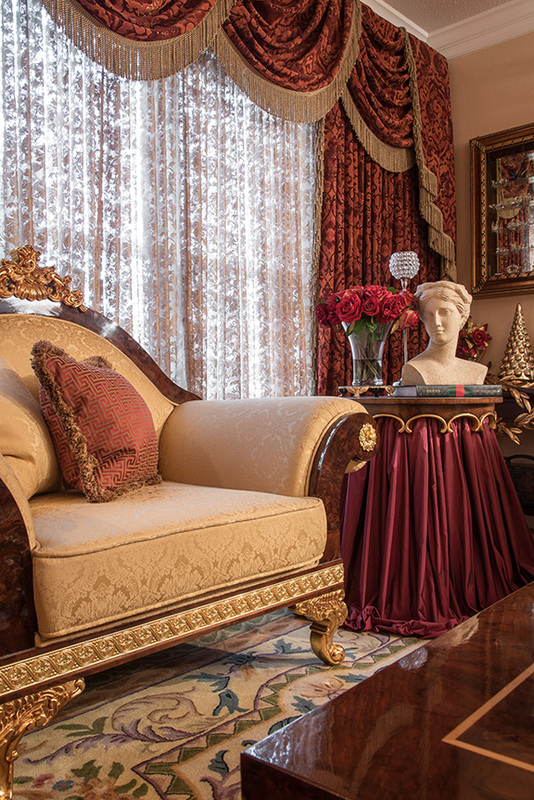 Accented with solid brass, the ornate details fit perfectly with the homeowners European-inspired look. With a true knack for design, Mandis says she always has a clear vision in her head of exactly what she is looking for in the home, plus she has the patience to wait until she finds just the right piece. Given most of the elements of the home were purchased and shipped from Europe, the Mandises waited anywhere from three months to one year to get items. Olga says the sitting room sat empty for nearly a year waiting for everything to arrive. But when everything finally made its way to Illinois, the results are simply stunning. Splashed in rich burgundy and tones of gold, the home is a showpiece of ornate furnishings, luxurious fabrics, stunning chandeliers and irreplaceable treasures while still feeling comfortable at the same time. It is no wonder that Olga would have the same clear vision and over-the-top style for her holiday décor. 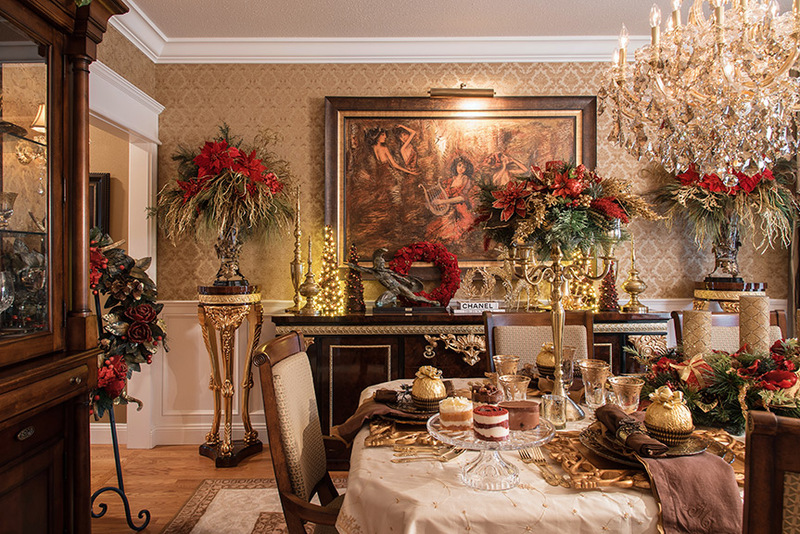 Though she changes up themes every couple of years, Mandis’s theme for this year is timeless elegance, which really plays up the burgundy and gold plus lots of velvet. Themes in years past have included royal baroque, golden elegance and chateau blanc. While many of her holiday decorations are reused from year to year, Olga says she finds new items throughout the year and buys them whenever she finds them, even if it is in July. “There just isn’t enough time if you wait to buy until Christmas,” she says. 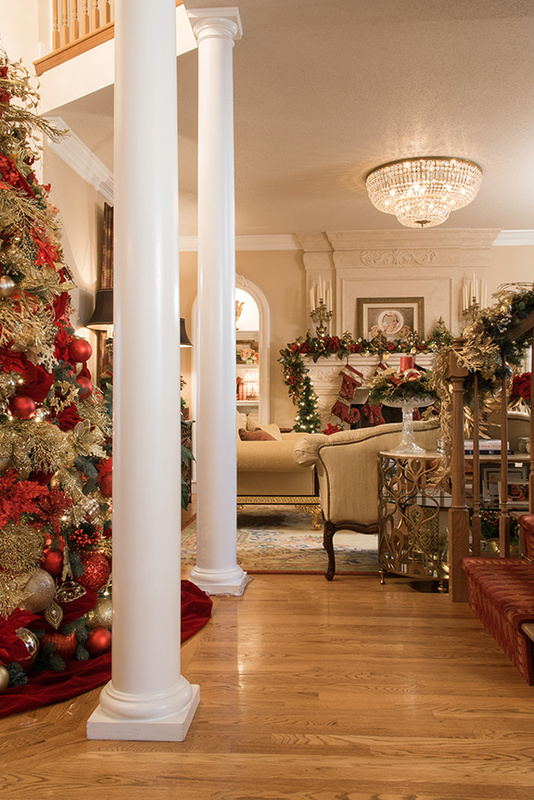 Incorporating everything from garland, wreaths, sprays, and candleholders, Olga even makes some of her own décor. “I will purchase a more generic floral piece and add my own touch,” she says. Like the arrangements in the dining room, for example. Simple holiday greenery is transformed into a seasonal showstopper with the addition of sparkling poinsettias, sprays of gold foliage and glittering pinecones. Carried throughout the dining room, the florals are displayed in multiple ways from matching candelabra centerpieces to a dramatic dining spread decked with gold candles to an adornment on the stunning chandelier. Olga then used the same hued and nature-inspired elements throughout the rest of the dining room décor. 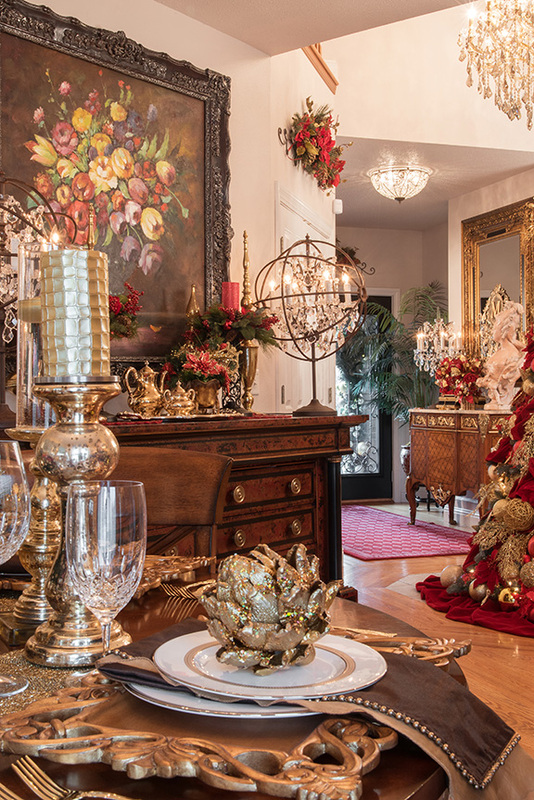 Lighted miniature trees and gold reindeer add merriment to the sideboard, which is displayed under a painting by famed Greek artist Theodore Ralis titled “The Muses” and purchased from the Athens Art Gallery. A bronze statue on the sideboard was handmade by Joe Ikonomakis, another famous Greek artist. For Olga, the dining room table is always formally set. Arte Italica dinnerware and glassware is properly set atop a vintage handmade silk embroidered tablecloth. A baroque-style charger from Neiman Marcus makes each guest’s place at the table over the top. Gold artichoke ornaments used as place settings add a special touch, as do the Michael Aram black orchid napkin rings. The Mandises try to entertain during the holiday season, and friends are always in awe of the jolly décor. With so much holiday ornamentation to display, Olga will take down a lot of her normal accessories to make way for Christmas. And, she is rearranging things all the time. In the sitting room, simple holiday additions like red candles, greenery and garland surrounding the fireplace mantel complement the intricate furnishings, which are a part of a luxury Italian lacquer furniture collection from Europe accented with solid brass. 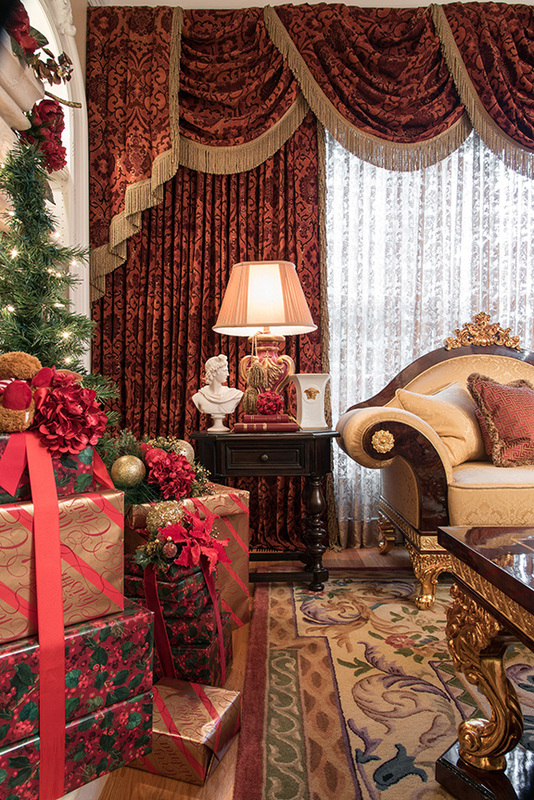 The sitting room draperies are a signature piece in traditional décor, and Olga handpicked all the fabrics herself. 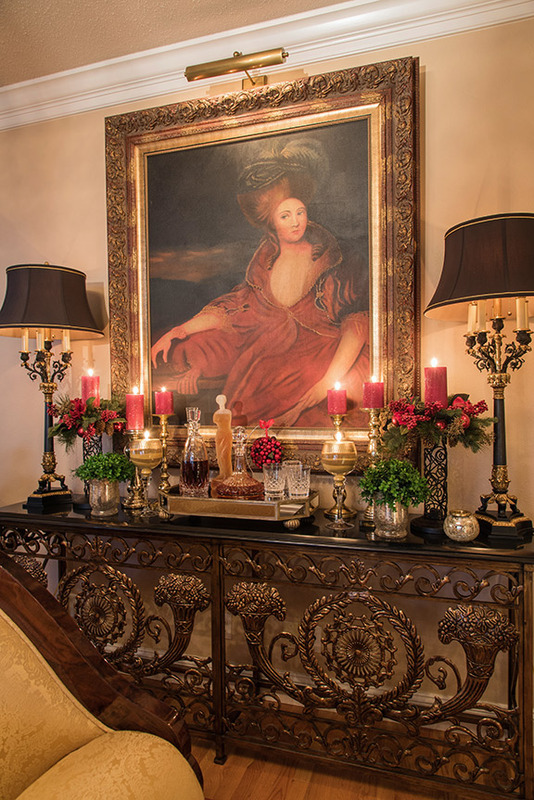 A beautiful Louis XVI-style oil painting titled “The Duchess” by Peruvian artist Barrientos is hung above an iron double console table with hand-forged iron scrolls and topped with granite. The accents displayed atop the table are all about balance and symmetry, which are a huge theme for Olga throughout the house. “I like symmetry and almost everything in the home is in a pair,” she explains. “The balanced, completed look is very important in traditional style.” Anchoring the ends of the console are black-and-gold candelabra lamps with shades by Jeanne Reed.